We began our 3rd day of pavilion hopping at the Italian Pavilion. Talk about being welcomed into a huge family! The cultural display supports the theme of Travel Italia and shares artefacts that you would find in different regions of Italy. There is even a photobooth set up to look like you’re riding in a gondola! Although it can be accessed anytime, the Marketplace is definitely a spot you’ll see towards the end of your visit. After the show, you are taken outside to a lovely outdoor eating area. Past this, you will see the large marketplace of souvenirs along with a cafe serving, of course, your favourite Italian pastries and desserts, and coffee. The Italian Pavilion was so generous to give us a sample platter. By sample platter, I mean a full sized meal of everything Italian! 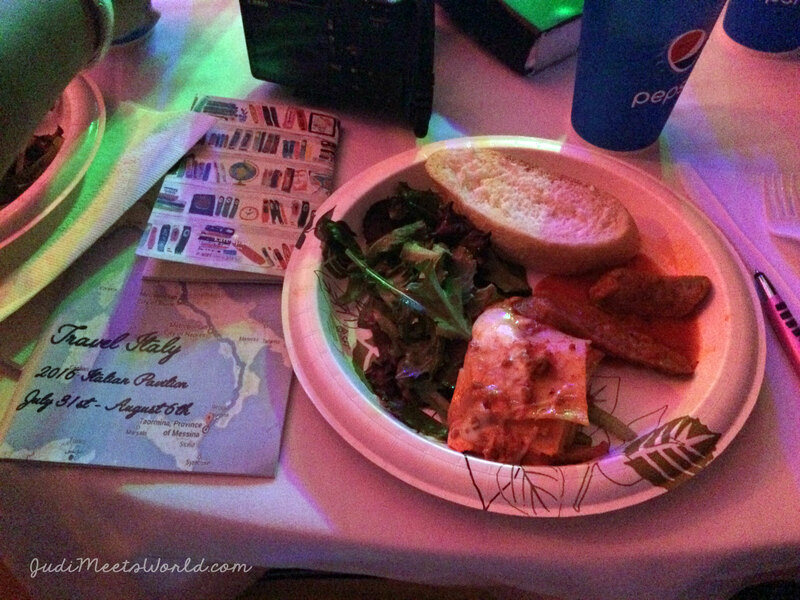 This meal had salad, lasagna, bread, and sausage – a hearty meal indeed! When the adult ambassador, Tonina Fiorentino said that the two most famous Italian words were “mangia, mangia,“ she really wasn’t kidding. The talented MCs for the evening, Gabriela Gesualdo and Davide Verrelli did a great job of touring the audience to the various cities of Italy. In our 45 minutes, we visited Rome, Milan, Pisa and Naples. We also stopped by San Remo and Taormina. The backdrop and set were exquisite with famous landmarks of the country. A tiny, wheeled gondola was also pulled onto stage and a young lady from the audience was serenaded by a gondolier. The dancers did graceful numbers with tambourines and scarves – and several singers came up to perform everything from contemporary numbers, to classic Italian songs. Most notably on the set list was 9-year-old Chiara Biondi Wilson who has performed for the past three years. Because Wilson sang so powerfully, there was an audible murmur in the audience after she performed. Evidently, people were really wanting more from this little girl with the huge voice! To conclude the show, the finale literally had crowd members at their feet as ambassadors and dancers found dance partners to a group ensemble performed in a Sicilian dialect. Programs are provided for guests at this pavilion. Inside, you can find the food menu, biographies of the performers, as well as greetings from supporters. In addition to that, you also receive two recipes – one from a Nonna Concetta. You know it has to be wonderful if it’s coming from someone’s nonna! Thank you again to the Italian Pavilion for such a warm welcome and your generosity! Ciao!